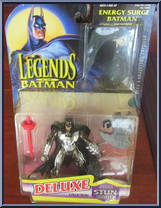 The Dark Knight scours the crime-charged streets of Gotham City as Energy Surge Batman. His specially-engineered suit is designed to absorb the electromagnetic energy in the air surrounding him, then channel its natural power directly into his sonic stun blaster. With this never-ending supply of electric power, Energy Surge Batman never runs out of ammunition, and never lets villains get the upper hand. Figure includes "sonic stun blaster". Contribute pictures, update details or suggest corrections for Batman (Energy Surge). Write a review about Batman (Energy Surge).